Karl Lagerfeld, a giant of the fashion industry, died last month in Paris at the age of 85. As creative director of Chanel, with whom he worked for 36 years, and Fendi, with whom he worked since 1965, he became an internationally recognized and highly-regarded cultural icon. By combining his brilliance as a designer with his cultural sixth sense, he was able to revive the house of Chanel and make it a worldwide fashion phenomenon, while at the same time designing collections for Fendi as well as developing his own fashion line. 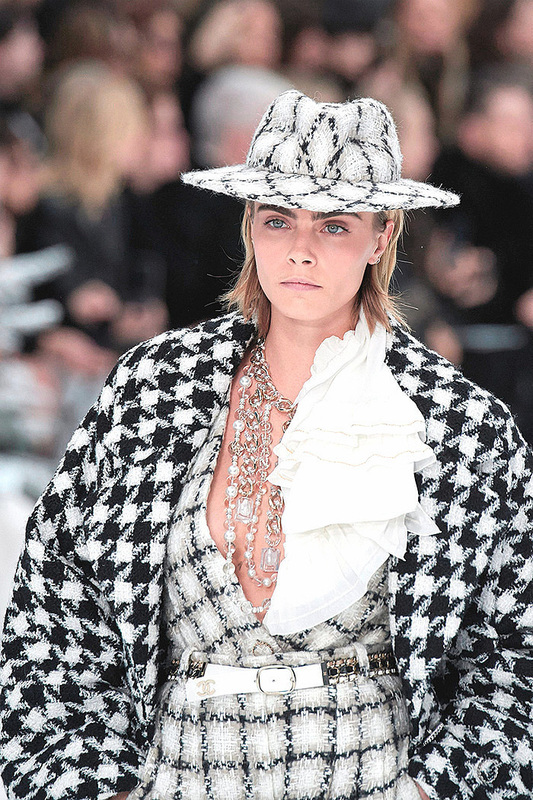 As Chanel’s success grew, so grew the lavishness of the sets Lagerfeld designed to showcase the six fashion collections he designed each year—sets backed with everything from Scandinavian icebergs to rocket ships to the Eiffel tower. He also created the concept of the traveling pre-season show, taking his shows everywhere from Seoul to Dallas to Versailles. 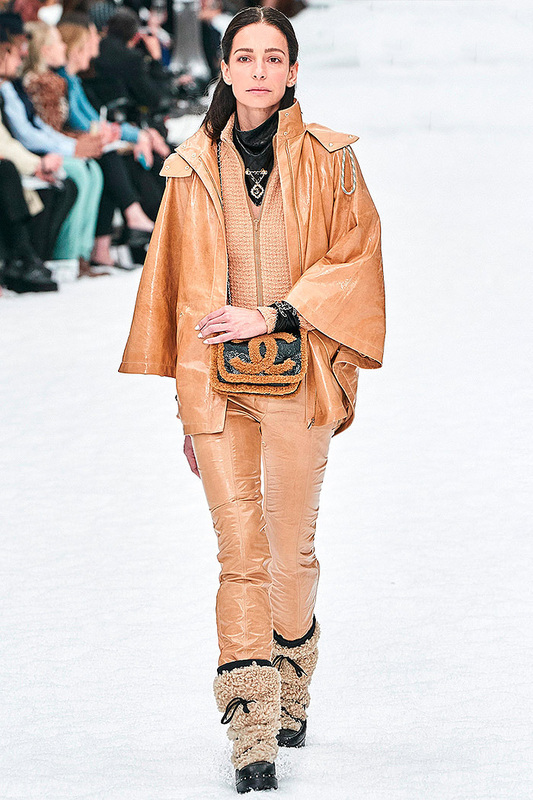 The collection was exquisite down to the last millimeter, filled with stiff, high, buttoned up collars that Lagerfeld so often sported himself, razor-sharp tailoring, and hosiery and shearling beautifully ablaze with Karl’s reimagined Fendi logos in his own handwriting (known as “Karligraphy”). Adding to it was a 40s style black suit with Art Deco palm fronds worked in to create a subtle tone-on-tone effect. His mostly neutral palette, set off at times with splashes of pink, yellow, turquoise and red, together with his precise tailoring (see the cocoa-hued suit with the white piping) served to unify the entire collection. 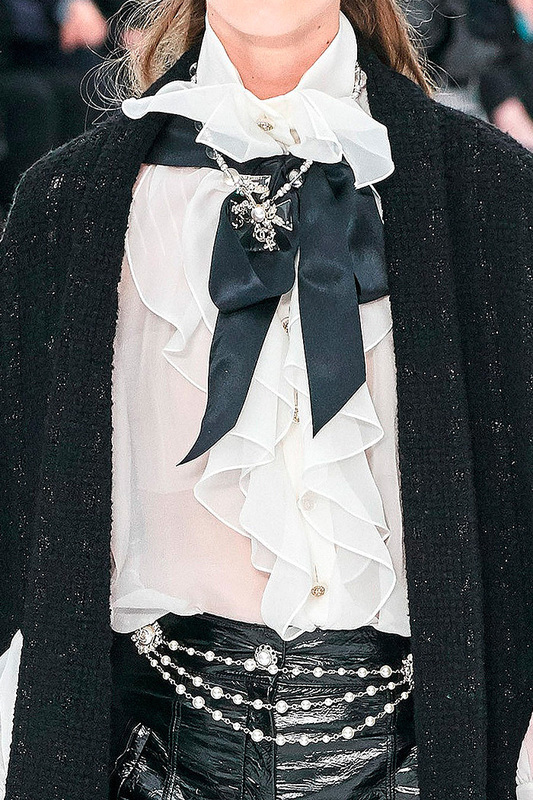 As a finishing touch for most of his designs, he added broad ribbons, threading them through the belt loops and allowing them to trail gracefully from behind. When Gigi Hadid closed the show in an exquisite translucent yellow-gold dress, all rose in honor of the beloved designer. Then came a film clip in which Lagerfeld was asked to make a sketch of what he was wearing the first day he worked at Fendi— 54 years ago. Karl, of course, recalled exactly what he had on and sketched it out as effortlessly as he’d sketched out all of the designs he’d created over the years. It’s like entering a painting. Karl Lagerfeld’s last set for Chanel is a place of beautiful snow-decked chalets high in the Alps, a serene winter-wonderland with the Chalet Gardenia at its center. After the models take their places in front of the chalet, a voice in French announces a minute of silence. A hush falls over the vast Grand Palais. To the sound of wind and the music of Nils Frahm’s Spells, Cara Delevingne steps out of the chalet in a long pied-de-poule coat and white-legged tweed suit. 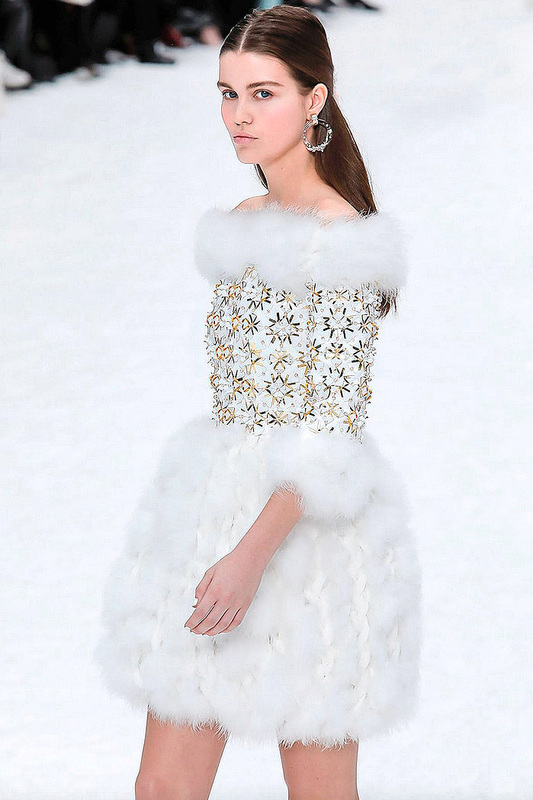 The other models proceed down the snowy lane of the Grand Palais in big coats over slouchy trousers and mismatched tweeds, followed by Nordic sweater dresses, colorful down jackets, classic black and white evening cloaks, ending with white feathered cocktail dresses looking like snowballs. Sparkling sequins, icicle and snowflake motif jewelry and accessories complete the impression of fragile snow creations. Virginie Viard, Lagerfeld’s right hand and successor, takes a short bow. A brand spokeswoman confirmed that she had continued tweaking the clothes following Lagerfeld’s death. The show ends with the soundtrack of David Bowie’s Heroes (which I found to be jarring, given the beauty of the show) with the models strolling down the snowy lane during the finale, wiping away their tears and the audience rising to give a standing ovation. I am deeply moved by the passing of fellow landsman, Karl Lagerfeld, one of the most brilliant fashion designers of our time. As a tribute to him I will soon be posting some of his designs which are my favorites.